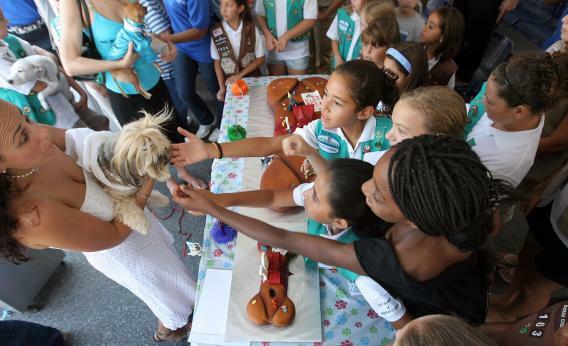 The Christian right attacks a 7-year-old transgirl who wants to be a Girl Scout. In September, I wrote a Slate piece about the Christian right’s brewing hostilities towards the Girl Scouts. While this may initially seem like the silliest right-wing bogeyman ever, I was forced to conclude that their hatred does make sense. After all, the Girl Scouts are all about sisterhood and empowering girls to think of themselves as fully formed human beings with aspirations beyond wife- and motherhood, which does fly directly in the face of Christian-right views on proper gender roles. Now the clamoring on the right for a boycott of the Girl Scouts has grown even louder, all because a troop in Colorado rescinded its decision to exclude girl-identified members who were assigned to the male gender at birth. The whole debacle began in October, when Bobby Montoya, a 7-year-old who was born with male genitalia but has identified as female since age 2, asked to join the local Girl Scouts. In a panic, they rejected Bobby, which brought national attention. The Girl Scouts of Colorado responded by changing their minds and giving GLAAD a press release that stated, “If a child identifies as a girl and the child’s family presents her as a girl, Girl Scouts of Colorado welcomes her as a Girl Scout.” While certainly this whole situation falls outside of most people’s experiences, even if you dispute that children can be transgender (which I don’t), this is the most common sense approach to the situation. The alternatives—humiliating transgender children or doing unpleasant things to “verify” your biological gender—are completely unacceptable. The Christian right reaction has been, well, telling. It started with this smug video from 14-year-old girl calling for a boycott of Girl Scout cookies and promoting a site called Honest Girl Scouts, which accuses the Girl Scouts of being “pro-lesbian, pro-abortion,” which is a stretch unless you think that it’s beyond the pale to teach girls anything but that they have no value outside of being fertile soil for male seed. Now WorldNetDaily has jumped on the bandwagon, using the hoary old insinuations that there’s real threat from straight male perverts who dress as women as cover to do bad things. Taylor, however, cites in the video GSUSA materials that outline the importance of the Scouts’ all-girl format and expresses concern about 12th-grade boys passing themselves off as girls.